Happy birthday to the Isaac Newton Institute! "It is fantastic to share in the excitement of new research results as they are happening. It's a thrill," said David Abrahams, Director of the Isaac Newton Institute, echoing the thoughts of many who've visited over the last 25 years. The Institute brings together leading mathematicians from around the world for weeks, or even months, at a time to indulge in what they like doing best: thinking about maths and exchanging ideas without the distractions and duties that come with their normal working lives. Time, coffee, something to scribble on (they have blackboards everywhere!) and most importantly, other researchers to chat to – the Institute provides the key ingredients necessary for producing first rate mathematics. At the celebrations of the Institute's 25th birthday, Abrahams commended the remarkable foresight of those, particularly Peter Landshoff and Peter Goddard, who conceived the idea of a UK institution devoted to the mathematical sciences in the broadest sense. One of the strengths of the Institute, says Abrahams, is that the "superb physical environment, created by the architect Duncan Annand)", as well as the scheduling of scientific programmes, is designed for interaction. And even though there might not at first seem to be any conceptual overlap between the two or even three programmes that might be running in parallel at any one time, this interaction often leads to new mutual understandings. for any power greater than 2. In 1637 Fermat famously scrawled in a margin that he had a marvellous proof of this result, "but the margin [was] too narrow to contain" it. Such a proof eluded mathematicians for centuries. Wiles explained how elliptic curves were integral to his work, and happily "Fermat did have room for them in his margins." Moving on from the 17th century to a paper by Poincaré in 1901 that launched the modern theory of these curves, Wiles took us through the progress that finally linked them to Fermat's last theorem and their role in his work. "One of the happiest coincidences in my life," said Wiles, "is that they [elliptic curves] were linked by Ribet and Fry [to Fermat's last theorem] and that set me off to prove it." 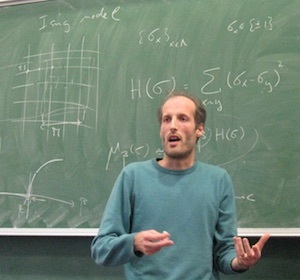 Next on stage at the celebrations was Martin Hairer, one of the most recent recipients of a Fields medal, the most prestigious prize in mathematics. His talk, "Bridging scales, from microscopic dynamics to macroscopic laws", explored the questions he has been thinking about for the last five years. He began with the two guiding principles behind probability. The first is the principle of symmetry – that if the outcomes are equivalent in terms of the mechanism producing them, for example getting heads or tails on a coin toss, then these should have equal probabilities. The second principle is universality – that if a random outcome comes as a combination of many different independent events, then the probability distribution of the outcome very often doesn't depend much on the probabilities of the individual events. An example of this is the central limit theorem, where, no matter what independent quantity you are measuring (for example people's weight, or height), you almost always end up with a normal distribution. A historical example of universality comes from Brownian motion – the tiny random motion of particles suspended in fluid, such as water. Einstein showed that the movement of these particles can be described by the heat equation, the equation describes the way heat spreads through a solid. The universality of Brownian motion comes from the cumulative effect of the collisions of the water molecules with the particles. Each individual shock from a collision is very small, but the cumulative effect gives the erratic motion that can be seen under a microscope. Brownian motion is apparent in many surprising places, such as the evolution of the stock market. (You can read more about Brownian motion here. Universality can also be seen in two dimensional systems, such as the burning edge of a piece of paper, the mixing of two liquids or even the stacking blocks of a Tetris game left unattended. All of these involve the evolution of a boundary between two regions. For this universality to become apparent you need to carefully zoom out from the boundary, and see it as the accumulation of the microscopic changes on the edges. It was this approach of Hairer's that was recognised with a Fields medal in 2014. And it is an excellent example of the interplay between disciplines, in this case physics and mathematics, which is at the heart of the Institute. There were many eminent researchers gathered to celebrate and enjoy the talks by Wiles, Hairer, as well as talks by Keith Moffat, a previous director, and Hannah Fry. There was also a chance to see some of the beautiful artwork on display in the institute, including the current exhibition by artist Nigel Hall. This is an example of the Institutes ongoing commitment to communicating and promoting mathematics to the widest possible community. They regularly host artists, often in collaboration with the researchers at the Institute. And the Institute is also responsible for our favourite maths posters, originally displayed on the London Underground. The Institute has had a special place in our hearts from the first hot chocolate and biscuits we shared in the atrium with Robert Hunt, then editor of Plus and Deputy Director of the Institute. Plus is fortunate to live just next door, and it has been a pleasure to work with the Institute and it's contributors over the years. Happy birthday! You can read more about the work done at the Institute in this series of articles.